Last November I announced a raffle to encourage people to include their children and other young people they know in meditating. And to make it fun. I got lots of pictures of people's kids meditating and families meditating. It warms my heart. I'm a month late in announcing the winners, but I believe in divine timing. Here are the winners and what they won! 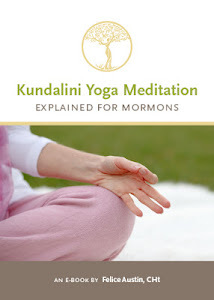 Catherine Dagsland $40 Credit for any Tree of Life Store Kundalini Yoga series. If you are a winner please contact me to redeem your prize. If you didn't know you entered this raffle then maybe you just have an angel who wanted to get your attention and so manipulated my random number generator. It's spring! This was a long cold dark winter. It for sure has been for me, but it is in the dark that seeds germinate. I feel like that little seed that just burst forth. Yay! Spring is always my power cycle, but it is especially nice this year. Since I added the Meditation for Cold Depression to my life, I have noticed a few things happening. Number one, things started dropping from my life. Lots of things. People, work, busy-ness, stress, my big house. In some cases it caused more stress because I was grieving the changes. But then I started to just let go faster because I could see how it was for the best. For example, letting go of my big house was great! It was time to consolidate because I wasn't really using it for retreats anymore and it was just too big to clean myself and there were lots of other things going on there that were not sustainable. In deciding to leave and looking around at the market, I realized that my husband and I could buy a house. So we are in a really cute rental for now, but we are getting our stuff together to buy a house. In Southern California, as a self employed woman, this is a big deal, and I never thought it was possible. But hey look! Pigs are flying all over the place. I can't say it is only because of the meditation. Oh no! That is only amplifying some other things I am doing. There has also been a very conscious and daily effort to surrender my life and my will to God. Since last year, when I realized that my life had become un-managable, I had to remind myself (daily) that a higher power could restore me to sanity. And so I turned all my managing over to that power as I understand it. And let me tell you: it works. Every time I feel that trying-to-make-things-happen tension in my body I breathe and give it up and trust and it usually works out way better in unexpected ways. I am feeling really healthy. All my blood numbers are totally good and I have energy and vitality just in time for spring and summer beach days. And I feel very mentally stable on a deep level. Like the level below where I felt good before. Way deeper. Deep Peace. In fact, my friend Michelle was in town last week and she said of all the time she has known me, I seem more content than ever before. Some of you know my husband and I only live together part time. Well, he had an opportunity to apply for a job closer to us and we don't know anything yet, but it feels like maybe it's time to let my fears go about living with him more than part time. So if you want to pray for our highest good and happiness, I am grateful for your prayers! We are in surrender to it. My daughter went to New York for United Nations and came back all grown up. I am grateful for everyone who donated money to her campaign and helped her by buying her art. I finished my 3rd semester paper for Grad school and am now writing poems like a mad poetic hatter and it's so wonderful to be creating. Poetry has this amazing ability to mend ruptures in our society and bring the song back into our lives. I have stopped teaching retreats for a while, maybe forever, who knows, and I am just seeing some clients, writing poetry, sharing some of the wonderful natural health solutions I have found, and this year I will be training teachers. 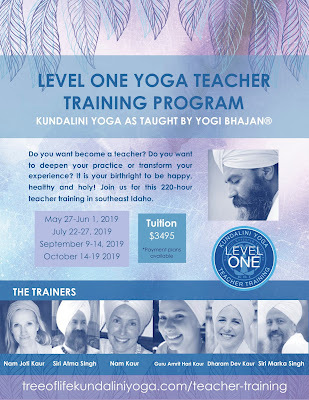 The Level 1 Kundalini Yoga teacher training I am hosting and teaching in SE Idaho will begin May 27, 2019 and despite having my original team drop out, God somehow arranged for an amazing group of other trainers to come and join me. There are still a few spaces left for those who want to come to this amazing 220 hour training. 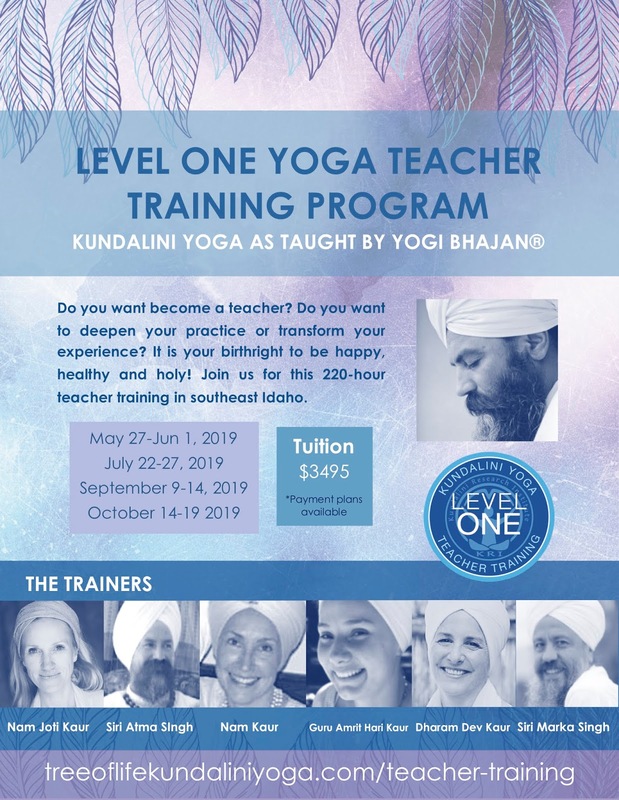 It will deepen your practice, transform your life and give you the credentials to teach with confidence and grace. As a teacher you have the opportunity to help people live in a more exalted way. For more info you can go to my website. We also have an interest group on FB that you can request to join.